Many businesses use Facebook to promote their brand. It’s a proven way to let potential customers know about your products and services and show them the human side of your company. And because your posts can be liked and shared, it helps extend your reach to new audiences that haven’t come across your business before. Facebook is also a great platform for interacting with followers. You can answer questions, respond to comments, share customer contributions and even use it to take care of customer service. 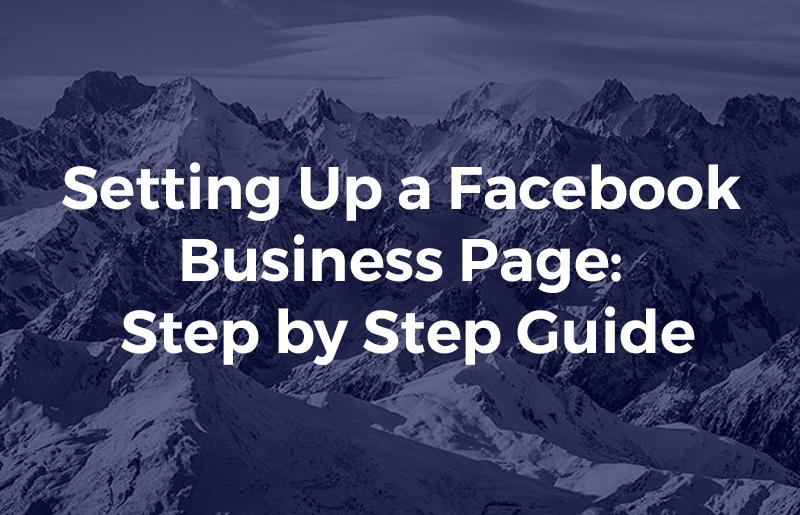 To do all these things, however, you’ll first need our step by step guide to setting up a Facebook business page. 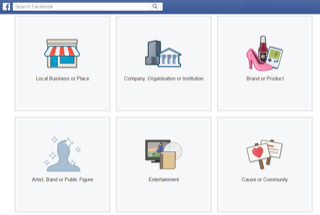 In order to set up a business page, you need to have a personal Facebook profile and be logged in to that account. Once you have done this, go to the Facebook’s Create a Page section. Pick this option if you are a business that caters for a local clientele. For example, a restaurant, garage or builder. Choose this option if your business is not limited to a specific location, for example, you operate regionally or even online. For those more concerned with promoting a specific product or brand, then this may be the most appropriate choice for you – especially if you are a manufacturer or do not sell products directly to the consumer. This is a great choice if your business involves entertainment, such as wedding singers, pub bands and magicians. This category is for entertainment and sports organisations, not entertainers and sportspeople. It’s ideal for casting agencies, recording studios or football teams. Choose this section if you are a non-profit organisation, a charity or someone raising funds for a good cause. By clicking on each of the boxes in the image above, you’ll be presented with a dropdown menu from which you must choose a business category. Choose the most appropriate category for your business. You can always change this later if you need to. Following this, you can add your business name before moving to the setup page. The short description is limited to 155 characters, so you need to be succinct in summing up the type of business you are and the services you offer. Without overdoing it, use keywords in the description as this can help the page be found on both Facebook and Google searches. If you are a local business, remember to include the location, too. Your page can have two images, a small profile image and a larger cover image. The profile image must be square and at least 180×180 pixels in size. If you use text, remember that the image gets resized for different devices, so don’t write things too small. The cover image is the first thing a visitor will see and, as such, is a key part of your Facebook branding – so make sure it represents the company well. Just like the profile image, this too will be resized on different devices. The size of a cover image is 828 pixels wide x 315 high. Ideally, it should be 72dpi, less than 100 kilobytes in size and saved as a .png file. 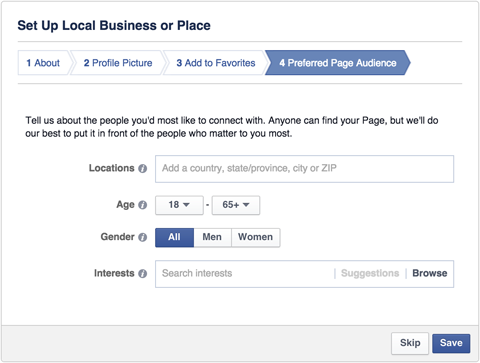 The ‘preferred audience’ section enables you to tell Facebook which demographic you want to target. You can choose by geographical area, age, gender or interest. Once you have finished the setup process, the page will be created and you can move on to configuring the settings. Until the page is complete and ready to go live, it is advised that you keep the page’s visibility to unpublished. You can do this in the General Settings section. Business pages can be set up so that posts are attributed to either the business or to your personal profile. We recommend that you keep your personal and business profiles separate by setting the attribution to publish posts in the name of the business. It is possible to enable other people to post and maintain your business page, for example, you may have an external agency, like Off Piste, looking after your social media. 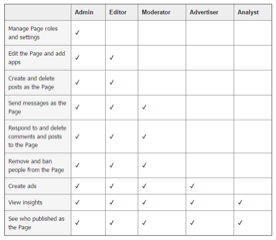 You can add these under the ‘Page Roles’. You can see the roles which can be assigned in the screenshot. We do not advise assigning another individual an admin role as this gives them permission to remove you as an administrator and even delete the page. The Featured section enables you to feature other people on your business page. This is great for companies that collaborate with others or for reaching out to influencers who can bolster your social media presence. Similarly, you may have experts in your team who have a high-profile personal account and you can feature them, too. As you can see, this enables you to provide a wealth of information about your business, though it is not compulsory for you to complete every section. Do make sure you do not simply copy and paste content from your website to your Facebook page. If you do, it will look like duplicate content to Google and could affect your website ranking. Instead, write things in an original way or just provide links to your website. At the end of the day, you want your Facebook visitors to engage with you. The call to action button provides this functionality enabling you to get visitors to do a number of things: contact you, shop at your store, book tickets, sign up for events or newsletters, watch videos and more. Before you publish your Facebook page, have some content on there for your first visitors to see. You don’t want them going to an empty page. As a minimum, make sure there is a selection of status updates, links, photos and videos. Hopefully, this article will have given you a full overview of the steps needed to set up your business Facebook page and shown you the most effective ways to carry out the process. If you want expert help in promoting your brand on social media, get in touch. We’ll be happy to help.